35 On that day, when evening had come, he said to them, "Let us go across to the other side." 36 And leaving the crowd, they took him with them in the boat, just as he was. And other boats were with him. 37 And a great storm of wind arose, and the waves beat into the boat, so that the boat was already filling. 38 But he was in the stern, asleep on the cushion; and they woke him and said to him, "Teacher ,do you not care if we perish?" 39 And he awoke and rebuked the wind, and said to the sea, " Peace! Be still!" And the wind ceased, and there was a great calm. 40 He said to them, "Why are you afraid? Have you no faith?" 41 And they were filled with awe, and said to one another, "Who then is this, that even wind and sea obey him?" A couple of weeks ago, I was in Istanbul to bless the wedding of my niece when I opened my email and noticed there was a request of me to prepare a meditation for the consultation on Syria. At first, I did not know which specific text I should reflect on; though I knew I should reflect on some biblical event in which people are in trouble and in need of God’s help. As I was collecting my thoughts, I received a call from the Syrian Orthodox Archbishop in Istanbul welcoming me to his diocese and asking about the situation in Syria—my home country. I told him that we were in need of his prayers, because the problems have no foreseeable end. We are like a boat amidst the crashing waves of the sea. At that moment, it came to my mind how Jesus rescued His disciples when they were being consumed by fear during that torrential storm out on the waters of the Sea of Galilee. I think that you will agree with me that much like the disciples on that night so long ago, the citizens of Syria are currently being buffeted by a great storm as they cross their own Sea of Life. The miracle of Jesus calming the storm is recorded in all three synoptic Gospels (Mark 4:35-41; Matthew 8:23-27; Luke 8:22-25). For each of their own specific reasons, the evangelists were interested in recording this miracle in their accounts of the life, death and resurrection of Jesus. Each Gospel account demonstrates the power Christ has over nature. Matthew presents Christ as one having been born in Bethlehem, and yet is the King of Heaven and Earth. Accordingly, in his account of the storm, Jesus is the King over every storm in life. In Luke’s Gospel, Jesus is the Son of Man, and He is shown to be able to exercise power over the storm. Writing to those believers living under the tyrannical rule of the Roman Emperor Nero, Mark presents Christ as a servant to humanity—able to rescue those in their time of need. Now, you may ask yourself, "How is it that Jesus can control nature?" The Bible emphasizes that Jesus is able to perform this miracle because He is the Creator. In his letter to the Colossians 1:16-17 St. Paul testifies, "for in him all things were created, in heaven and on earth, visible and invisible, whether thrones or dominions or principalities or authorities—all things were created through him and for him. He is before all things, and in him all things hold together." This testimony to Christ’s central role in the act of creation is repeated throughout the Scriptures. Again in 1 Corinthians 8:6, the apostle declares, "yet for us there is one God, the Father, from whom are all things and for whom we exist, and one Lord, Jesus Christ, through whom are all things and through whom we exist." The place in which the miracle happened is a very familiar place for the disciples. For some of them, they knew the lake from their professional lives as fishermen. The others having grown up in the region would have been familiar with the place and its frequent and terrible storms from the days of their youth. And all of them had traveled with Jesus around the lake as He ministered to the peoples in the area. It was here in this place that Jesus taught multitudes from the vantage point of a small fishing boat. Sitting by the lake, Jesus delivered His seven parables as recorded in Matthew 13. On these banks he called Peter and Andrew, James and John to leave their nets behind and follow Him. From the waters of this lake He commanded His disciples to throw the net "on the right side," resulting in a miraculous catch of fish. Nearby this lake, He twice fed multitudes from a few loaves and fish. On its shores, Jesus healed the man possessed by Legion. And later He would appear to the disciples after His resurrection. I think it will prove to be helpful to take a moment or two to refresh our minds about the setting of the story at hand. On the northern end of the Sea, near the villages of Capernaum and Bethsaida in the territory of the Gennesaret, Jesus sat down by the lake and began to teach. At 15 miles in length, and 6 miles across at its widest point the lake itself is not all that large, though it is the largest freshwater lake in the region. It is located some 30 miles inland from and 682 feet below the Mediterranean Sea in the Jordan Great Rift Valley, through which the Jordan River flows. It is surrounded by mountains from which it collects surface runoff water, as well as water from underground springs. In this process, freshly melted snow from the peak of nearby Mount Hermon, via the Jordan River, descends a total of 10,000 vertical feet before it reaches its new home in the Sea of Galilee. The reason the waters of the Galilee are made so turbulent is because winds regularly come down over the top of the Golan Heights just east of the Sea. When they hit the lake, these cold winds collide with warm air trapped in the lower basin, turning its waters into a boiling caldron. Such conditions make the lake a very precarious place to be at the wrong time. Certainly, Jesus and His disciples knew what kind of waters they were launching their boat out onto. And yet they had no concern about the possibility that the lake might erupt into a violent storm. There are a few possible explanations for their lack of concern. Perhaps they were simply traveling at the right time of the year. Perhaps the disciples simply felt that because they were traveling with Jesus all would be well. And yet, perhaps Jesus took them out on the lake to test their faith in a time of great stress. The Gospel narrates that after a long day of ministry, Jesus wanted to cross the Sea of Galilee. While traveling He fell asleep as the disciples maneuvered through the waters. Yes, He is a perfect God, but He is still a perfect human, and according to His humanity He needed some rest like the rest of us. As the storm set in, a panic took hold of those in the boat, and presumably the other passengers in the other boats who joined Jesus in crossing the lake. Together they faced this great danger. As the water began to come over the sides of the boat the disciples attempted to save the boat, but eventually the water inside became so much that the boat started to sink. It was only at this time that they chose to awaken their Master. But why did they not wake Him up at the very beginning? Maybe they did not want to disturb His sleeping. It was only when they were desperate and began to stare death in the face that they came to Him. They did not ask Him to come and help at the very beginning, but only as their fears became too great for them to handle by themselves. "Teacher, do you not care if we perish?" they cried. There was nothing they could do that would save them from the turbulent winds and the crashing waves. And although Jesus was deep asleep, at the same time He knew about the danger at hand. By the fourth chapter of Mark’s Gospel, it would have been clear to the disciples that Jesus possessed a great power to heal the sick and drive out demons. But it is in this passage that they come to know his creative power covers not only the human person — body and soul — but also nature. When Jesus rises from His sleep, He does not at first speak to the disciples, but to the winds and the waves, telling them to be quiet and to be still. By doing so, Jesus eliminates their reason to be afraid. But what did the disciples expect Jesus to do once they had woken him? 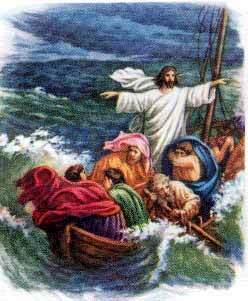 After all, Jesus was not a fisherman; He was not well acquainted with managing a boat during these kinds of squalls. Yet, following His miraculous calming of the waters they are merely left to wonder in astonishment, "Who then is this, that even wind and sea obey him?" Likewise Mark’s Gospel leaves the reader with the implicit conclusion that this master of theirs truly is the Master of all creation. So what do we learn from Jesus’ calming of the storm? Behind every literal meaning of Jesus’ healings and miracles, stands a figurative meaning. The storms of life really are quite similar to the storm on the Sea of Galilee. People regularly endure the destructive power of tornadoes and hurricanes, they face life-storms such as sickness, war, unrest, economic crises, scandals, and all sorts of painful life experiences. As long as we live on Earth, as long as we live near the Sea of Galilee, we ought to continue to expect raging storms. For, as we are reminded in 1 Peter 5:8, "the devil prowls around like a roaring lion, seeking some one to devour." We are continually surrounded by the powers of Satan. Often our immediate response is that we are afraid of his attacks. But we must trust in the presence of God, turning to Him in search of His help. But what happens when God does not come to our rescue immediately? Do we not begin to question God? "Are you there at all, don’t you care about us?" But we would be remiss to overlook God’s response: "Why are you afraid? Have you no faith?" Have you forgotten that the One who has power over life also has power over death? What does this miracle mean for us who are meeting together in consultation on Syria? How should we react as believers in God when we see our homeland going through such dark times? We are praying for peace, and we believe that no resolution to the current situation will emerge except by peaceful dialogue. We cannot solve these troubles by making war and hoping that peace will follow. War will bring an even greater storm — it will break the boat and it will destroy the country and all its neighbors. In many ways, we are like the disciples. We are terrified of the prospects of war, because it will mean our destruction and that of our neighbors. And still we believe that God and only God can prevent war and its destructive fallout. God can turn the hearts of people from hardness and selfishness to gentleness, peacefulness and creativity. Proverbs 21:1 reminds us that, "The king’s heart is a stream of water in the hand of the Lord; he turns it wherever he will." And again Malachi 4:6 tells us that, "he will turn the hearts of the fathers to their children, and the hearts of children to their fathers"—that is, the heart of the king to the hearts of the population.